Laurence is one of those ‘no women, no kids’ hired killers, but he’s not really sure about his co-workers. 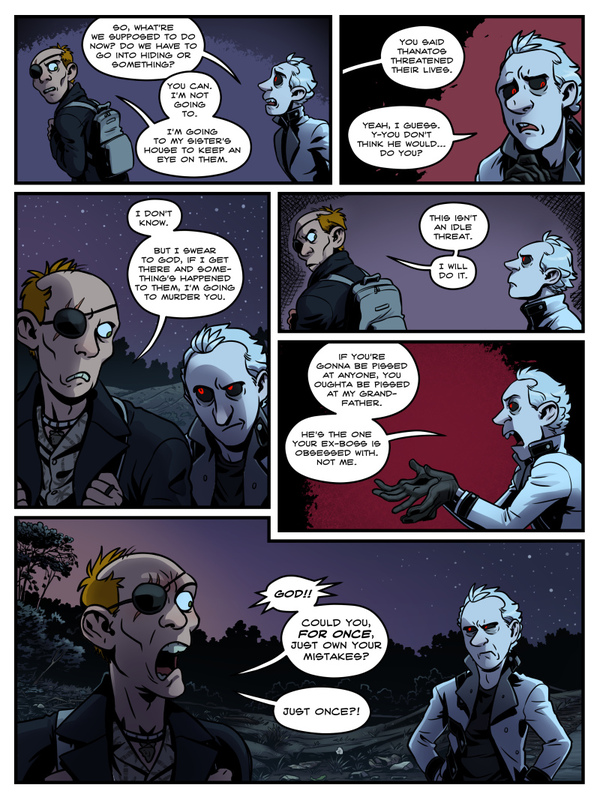 I want to be horrified at Schtein’s immaturity, but I’m laughing too hard at the last panel for that. 3rd panel, love the Doc.’s skeptical face, but on the last panel I don’t even know what the hell is wrong with him XD. Is he emotionally constipated? Seriously its the funniest face hes made so far and I should be horrified at his almost nonexistent concern for his family but that face is just too much XD. “Emotionally constipated?” Well, he *is* a guy, you know. I might have missed something but isn’t murder a bit harsh Laurence. Also you knew what he was like when you married and according to the rule I haven’t just made up right now you aren’t allowed to back out of it. The way they are yelling at each other, I hope Opa Schtein and the other “Scanners” kids (well, former kids, they’re grow-ups now, but you know what I mean) hear them and come over to say hello. The others should recognize Herville, should they? You might want to warn her and her mother about some old guy with glowing eyes coming for a visit… so they can buy cake. “Someone’s eye” wins the internet today. On a different topic, has anyone told Herville that Langstrom is still alive? How many people even know that? I like how this whole sh*storm was going down with all the new characters, and now we’re following the two who quietly snuck away.